"Very easy dessert with wholesome granola and oats for the topping. Not too sweet for those who prefer natural peach flavors. Good peaches make the difference, but you can use canned. Serve warm with fresh whipped cream." 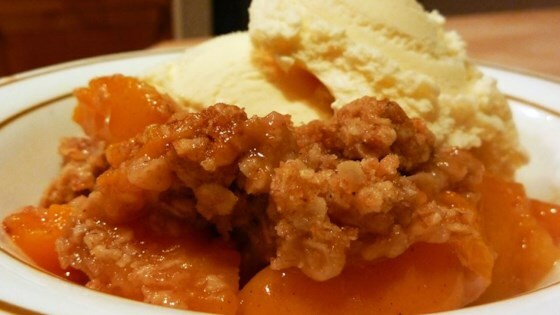 Granola and oats combine with fresh peaches in this 5-star dessert. This is a very nice blend of tartness and sweetness. the granola topping was awsome however the peaches came out just a bit tart. I loved it as did my fellow co-workers. This was tasty. I had a lot of peaches so I used my lasagna pan. I used 2 cups oats & granola, 1 cup brown sugar, no flour & 1/2 cup butter. Nice & brown with a good crunch.